India’s filthy air is cutting 660 million lives short by about three years – while nearly all of the country’s 1.2 billion citizens are breathing in harmful levels of pollution, new research reveals. The study, by a team of environmental economists at US universities, highlights just how extensive India’s air problems have become after years of pursuing an all-growth agenda with little regard for the environment. While New Delhi last year earned the dubious title of being the world’s most polluted city, the problem extends nationwide, with 13 Indian cities now on the World Health Organisation’s list of the 20 most polluted. That pollution burden is estimated to be costing more than half the population at least 3.2 years of their lives, according to the study led by Michael Greenstone of the University of Chicago and involving economists from Harvard and Yale universities. The most polluted regions, falling generally in northern India, are also among India’s most populous. “The extent of the problem is actually much larger than what we normally understand,” said Anant Sudarshan, the India director of the Energy Policy Institute of Chicago and one of the study’s co-authors. Added up, those lost years come to a staggering 2.1 billion for the entire nation. For the study, published in Economic & Political Weekly, the authors borrowed from their previous work in China, where they determined life expectancy dropped by three years for every 100 migrograms of fine particulate matter, called PM2.5, above safe levels. PM2.5 is of especially great health concern because, with the particles having diameters no greater than 2.5 micrometres, they are small enough to penetrate deep into the lungs. The authors note, however, that their estimations may be too conservative because they’re based in part on 2012 satellite data that tend to underestimate PM2.5 levels. India has a sparse system for monitoring air quality, with sensors installed in only a few cities and almost unheard of in the countryside. Yet rural air pollution remains high courtesy of industrial plants, poor fuel standards, extensive garbage burning and a heavy reliance on diesel for electricity generation in areas not connected with the grid. Wind patterns also push the pollution on to the plains below the Himalayan mountain range. India sets permissible PM2.5 levels at 40 micrograms per cubic metre – twice the WHO’s safe level. Still, the study says, 99.5 per cent of the population is living with air pollution levels above the WHO’s limit. While India has pledged to grow its clean energy sector, with huge boosts for solar and wind power, it has also committed to tripling its coal-fired electricity capacity to 450 gigawatts by 2030. Yet there are still no regulations for pollutants like sulfur dioxide or mercury emissions, while fuel standards remain far below Western norms and existing regulations are often ignored. To meet its goal for coal-fired electricity, the Power Ministry says the country will double coal production to a billion tonnes within five years, after already approving dozens of new coal plants which experts say will double sulphur dioxide levels. Hebei, a northern region with the worst air in China, faces an enormous challenge in cleaning up its dirty air as data showed that little more than one third of all days last year met quality standards. The air quality index (AQI) in 129 days, 35.3 percent of days in 2013, was below 100, Chen Guoying, director of the Hebei provincial bureau of environmental protection, told a local legislature on Wednesday. The province, which surrounds the national capital Beijing, had 80 days, or 21.9 percent, of severe air pollution (AQI readings higher than 200), Chen said. According to statistics published monthly by the Ministry of Environmental Protection, Hebei is home to up to seven of the country’s top 10 polluted cities. “Heavy smog hit at the time of the “two sessions” in 2013 and again this year,” said Liu Ronghua, a local political advisor, at a panel discussion at the annual meeting of the provincial people’s political consultative conference. The “two sessions” refer to the annual meetings of the local legislature and political consultative conference. “Smog has triggered a survival crisis and people are wondering where is suitable to live. Some are fleeing big cities to avoid the toxic air,” Liu said. 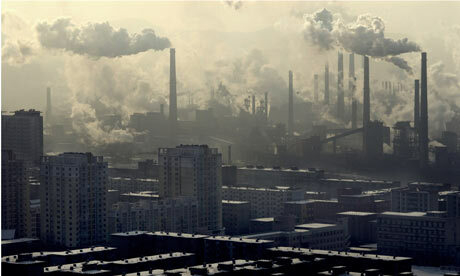 Hebei’s economy is dominated by highly polluting and energy guzzling heavy industries, which contributed to up to 77 percent of all emissions into the air, according to Chen. The three sectors of steel, petrochemicals and construction materials account for half of its industrial output. Hebei churned out 180.5 million tonnes of steel last year, the largest among all provincial-level regions, Chen said. To tackle the severe air pollution, the provincial government has banned approvals of new steel, cement, glass and nonferrous metal plants. Meanwhile, it has pledged to cut its annual steel and cement production capacities by 60 million tonnes respectively by 2017 and to reduce its annual coal consumption by 40 million tonnes from 2012 levels under the same time frame. To meet the targets, authorities will encourage mergers and acquisitions and order closures or use pricing reforms to prompt outdated facilities to shut down. Hebei has entered a period of painful economic transition and the government will focus more on environmental protection and greener growth rather than on pure gross domestic product expansion, said Zhang Qingwei, governor of Hebei. The central government is becoming more serious in tackling pollution as the choking air has become the target of growing discontent among urban residents. In September, the State Council, or the Cabinet, signed air pollution control initiatives with six provinces and municipalities in north China, including Beijing, Tianjin, Hebei, Shanxi, Inner Mongolia and Shandong, in a coordinated effort to tackle severe air pollution. The prevalence of smoking in China tends to fudge the contribution of air pollution to the growing incidence of respiratory disease. A couple of examples that emerged this month are timely reminders of the cost of China’s rapid development. In one, an eight-year-old girl has become the nation’s youngest lung-cancer patient, with doctors linking her illness to environmental factors. Dr Feng Dongjie of the Jiangsu cancer hospital says the girl lived on a busy road where she inhaled dust, including superfine particles considered to be the most lethal component of smog. The other example recalled the saying that a picture is worth a thousand words, except in this instance it was the lack of a picture. The smog that hung over many Chinese cities, including Beijing, last month was so bad in the northeastern city of Harbin , where visibility fell to below three metres, that even public security surveillance cameras could not penetrate thick layers of particles. The immediate concern for the authorities is safeguarding national security though a street surveillance network. They should also be deeply worried about the effects of smog on the public’s health as they are insidious and, if and when the air clears, will linger much longer. Benxi steel mills blowing smoke over residential buildings. China should see its first lawsuit by an environmental group against authorities within weeks, state media reported today. A member of the All-China Environmental Federation – which is backed by the central government – said a judge in Guizhou province had accepted its claim on behalf of residents who complain they have suffered from pollution. Residents allege that the Qingzhen land resources bureau leased land to a drinks factory in 1994, but construction of the factory has not been completed and they believe the site is damaging two adjacent lakes from which they draw drinking water. They want the government to take back the land and remove construction materials. Ma Yong, director of the legal service centre at the federation, told the Associated Press the case would open in early September. “The case will serve as a warning for government departments and companies that damage the environment, as we’re stepping up efforts to play a supervisory role,” Ma Yong said. He added that he hoped it would pave the way for other organisations to file public-interest lawsuits. She added: “No matter what the conclusion is, we hope it will serve as a warning to government departments such as environment, forestry and other agencies, that they should always fulfill their duty to protect the environment. Environmental activists complain that courts usually turn away such cases. “If this leads to more non-governmental organisations bringing public interest litigation I think this is a very important breakthrough. It means China is going to open the door to more public involvement in environmental enforcement,” said Alex Wang, a senior lawyer with the Natural Resources Defense Council, a US environmental group. In a separate development, China is to shift a planned £3bn oil refinery and petrochemical plant in the south after years of public outcry. Wang Yang, the Communist Party chief of Guangdong, said the province would move the plant – a joint venture between China’s Sinopec and the Kuwait Petroleum Corporation – because of opposition from the community and officials. “We only have one planet to live on, so whatever we do on this end will affect others on the other end,” Wang told reporters at a news conference on Thursday. “The decision by the government shows that they do consider the opinions from different stakeholders across the region, which is a positive sign,” said Edward Chan, a Greenpeace campaign manager based in Hong Kong. “Our worries now are that the residents [in the new area] are not as well-educated or informed, or may be more eager to look for economic development. It is thought the factory will be relocated away from Nansha to Zhanjiang in western Guangdong, a less ecologically sensitive area. Two major business groups have thrown their weight behind the air quality improvement plan unveiled by the government two days ago, despite reservations voiced by a clean air advocacy group. Teresa Au, deputy chairwoman of the General Chamber of Commerce environment and sustainability committee, said it was worth paying for better air, which was vital to the city’s competitiveness and attractiveness to overseas talent. “There is always a price for better environment and long-term benefits will require some short-term investments,” she said. But the Clean Air Network, a newly formed advocacy group on air quality, said even if the new targets were met, it would not be enough to prevent harm from bad air. A consultation paper has proposed a set of air quality objectives and 19 control measures to attain them. It offered no timetable but said the measures had the potential to increase the average life expectancy of city dwellers by a month. Ms Au said the lack of a timetable would give officials room to negotiate with power firms and bus operators who would be asked to use cleaner fuel and phase out polluting vehicles. She said the chamber would submit a detailed response later. Mr Suen said that if power stations had to use cleaner raw materials to improve air quality, consumers would be prepared to pay more for electricity. But the Clean Air Network said if the measures were implemented, there would still be at least 950 premature deaths a year, compared with about 1,100 based on emissions figures for 2007. The estimates were projected from the Hedley Index, developed by local scientists, which tracks the health and economic costs of pollution. Lai Hak-kan of the University of Hong Kong’s department of community medicine said new sulphur dioxide targets could be worse than the existing ones as they allowed more exemptions. “We are surrounded by ports in the region and many ocean-going vessels are using dirty fuel loaded with sulphur. But we do not see the government taking it seriously,” he said. Meanwhile, Secretary for the Environment Edward Yau Tang-wah told RTHK that the consultation was “not all about expenses”. Green Island Cement (Holdings) has described as “irresponsible” and “illogical” the government’s move to slap a HK$20 million environment assessment report requirement before allowing it to bid for a sludge management project. Green Island – a subsidiary of Cheung Kong Infrastructure – said it was given the requirement at a meeting with the Environmental Protection Department. “It is impossible for Green Island Cement to spend HK$20 million to conduct an environmental assessment when it remains uncertain if it is eligible to bid for the project,” a company statement issued yesterday said. The firm said it is baffled by the government policy of not considering the company’s eco co-combustion system, which cost only HK$3 billion – one-third of the government’s budget of HK$9 billion – to build the sludge treatment and integrated waste facilities at Tap Shek Kok, Tuen Mun. Last Thursday, Legislative Council public works subcommittee chairman Raymond Ho Chung-tai slammed the government’s inability to accept the latest technology introduced by Green Island Cement. In its letter to the department last August, the company said the proposed eco co-combustion system has substantial benefits in reducing coal use and recycling all bottom and fly ash to make cement.